THP 4-13-014 TUO (Guns and Roses THP) Sierra Pacific Industries, 383 acres; 49% clearcut, 28% operational buffer, 16% shelterwood, 4% commercial thinning, 2% selection logging. McCormick Lookout, Upper Rose Creek (MD: T3N R16E Sec.1; T4N R16E Sec.25, 26, 27, 28, 29, 30, 32, 33, 34; T4N R17E Sec.36). Winter operations, moderate erosion hazard, steep slopes up to 65%, 8 road drainage work sites, 2 oversized units, herbicides, 10 CA spotted owls within 1.3mi, goshawk within .25 mi, pansy monkey flower, Stebbin's lomatium, scattered large trees. Estimated public comment deadline: 09/06/13. 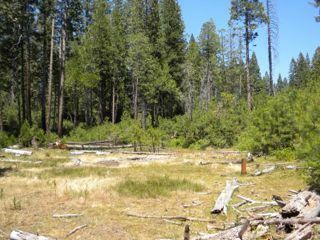 This THP is about 6 miles SE of Arnold, CA and Highway 4 near the Middle Fork of the Stanislaus River at an elevation of 4,200 to 5,000 feet. The area is close to the 2009 Knight Fire which burned over 6,130 acres and had some salvage logging. Sierra Pacific Industries is planning a tractor and cable mostly clearcut logging operation in mixed conifer forests. Tracked excavators are planned for use on steep slopes for fuels work, and 825 feet of new road construction is planned. Units 1703 and 1869 are oversized. There are 8 road drainage work sites including rocking, dip construction and culvert maintenance. SPI wants to be able to do road improvement projects without amendment into the THP when no watercourses, waterholes and road construction/re-construction is involved. Pansy Monkey Flower was reported to be on the road and landing immediately adjacent to unit 1728, and Stebbin's Lomatium has been seen in the THP area. There is 1 Northern Goshawk nest site (1999) within .25 mi of units SHR-2 and SHR-3. More information is available on the THP Tracking Center website.